The story of a department-store trainee who became the richest man in America and owner of the biggest retail store in the world: Walmart. 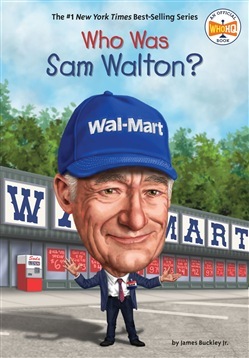 Sam Walton used the money he earned in the army, along with some financial help from his family, to open his first store. Then he opened fourteen more. Then Sam had an even bigger idea. He wanted to build large stores in small towns and reduce the price of everything they stocked. Although other businessmen and potential partners laughed at him, this entrepreneur with humble beginnings used his resourcefulness to create Walmart, which would become the largest company in the world. Acquista Who Was Sam Walton? in Epub: dopo aver letto l’ebook Who Was Sam Walton? di Buckley Jr. James, Who HQ ti invitiamo a lasciarci una Recensione qui sotto: sarà utile agli utenti che non abbiano ancora letto questo libro e che vogliano avere delle opinioni altrui. L’opinione su di un libro è molto soggettiva e per questo leggere eventuali recensioni negative non ci dovrà frenare dall’acquisto, anzi dovrà spingerci ad acquistare il libro in fretta per poter dire la nostra ed eventualmente smentire quanto commentato da altri, contribuendo ad arricchire più possibile i commenti e dare sempre più spunti di confronto al pubblico online.